You are here: Home / Trailers / “All this… because of a puppy?” – the John Wick: Parabellum trailer is HERE! Brutal. Vicious. Unrelenting. Surprisingly funny. Yet somehow stunningly beautiful too. And that’s just me if anyone dares to get between me and multiple rewatches of the new John Wick: Parabellum trailer. The new characters look intriguing (I particularly like Sofia who just… shoots John) but I can’t deny how much I love Ian McShane’s Winston, supposedly on the opposing side but always ready to give his favourite a helping hand. And the Bowery King (Laurence Fishburne), whose long drawn out pronunciation of “Jahhhnnn Wick”, both mocking and terrifying, makes clear to The Adjudicator (Asia Kate Dillon) that she’s in way over her head. I love how the franchise is both deeply committed to its world and its eternal violence while at the same time raising an amused eyebrow at the single-minded commitment of its citizens – Wick on a horse (If Keanu Reeves doesn’t end the movie soaring into the sky atop a fire-breathing dragon, I’ll be asking for my ticket money back), orchestral music bouncily soundtracking bloody deaths. Oh yes and as John says, “it wasn’t just a puppy”. 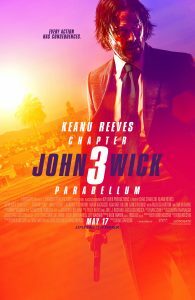 John Wick: Parabellum is directed by Chad Stahelski and is released in the UK and US on 17 May 2019. Check out the previous trailer, and previous images.